Sunday 1st. February, 2015 – So much to hope for ... but not today! Friday 11th. April, 2014 Progress under attack! I got up and walked Mix. Came home and had a plate of porridge for breakfast and then started on emails and bits and pieces. I kept an eye on the cricket – England have plumbed a new low today (that’s not strictly accurate because we were beaten by Bangladesh before) and now we are out of the World Cup. There will be repercussions for both players and management, I would imagine. Certainly we have played rather badly when compared to other teams. 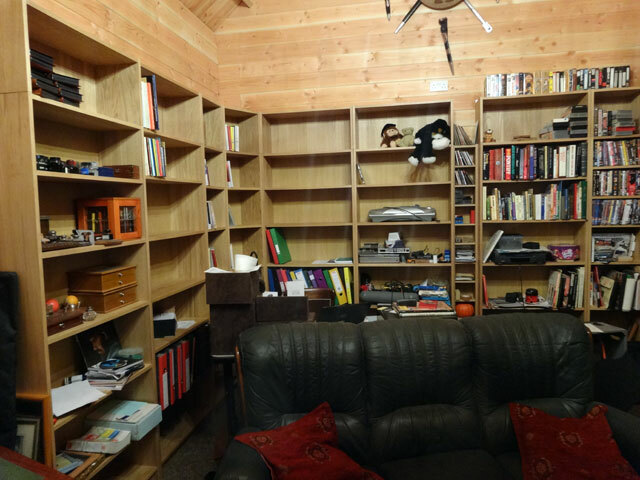 Rachel has now got all of her books and things out of the Bothy and into her new study so I was in the Carriage Shed unloading boxes of books and tidying them into the Bothy – a long job but I got a lot done. Mum went off to school today to help the children with a project about the war. She enjoyed her time there and the questions which the youngsters asked. David came down this afternoon to do some work on the trailer in preparation for the boat going into the water at Amble fairly shortly. Of course we had coffee before David went off to a Town Council committee meeting to see what was going on. I went off for another walk with Mix after which we dined in the farmhouse before watching University Challenge and the second part of a series about Conan Doyle. Then I walked Mix and went to bed (catching a bit of the News before I went).